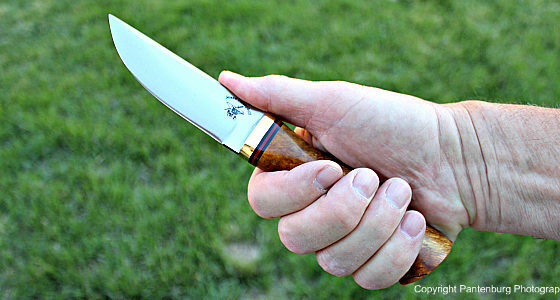 I review knives, and must barter, trade or sell some to pay the bills and acquire more knives to review. A reader asked if there was one particular knife I wouldn’t sell. Here are six. Some physical items become touchstones to great memories. Some knives do that for me. For that reason, I have several worn, semi-grungy knives that couldn’t be replaced and that will never be sold. Mora 840 Companion: Several years ago, I bought several Mora knives to field test as potential knives for Boy Scout Troop 18 in Bend, Oregon. A scout nearly severed his finger at camp the previous summer, when a combination of stupid knife handling and a faulty lock on a folder created a serious accident. So after trying out several different styles and brands of blades, and some use and downright abuse, the troop settled on the Mora 840 Companion. (Read the review.) We got a great deal on 40, from an Eagle Scout who owns a knife store, and were able to sell them to the scouts for $8 each. A few years later we ordered 50 more, and the scout price was $10 each. The scouts have used these knives hard, as only an enthusiastic kid can, and there has never been a failure in any of the Moras. I used the hell out of my original Mora. 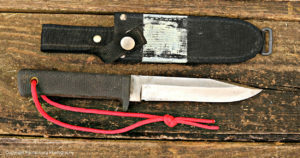 It was the knife I took along on camping and canoe trips and loaned out to beginners. Basically, it was disposable – if the Companion got lost in a creek of deep snow, I could get another for under $20. A scoutmaster friend of mine also got a 840 as a utility knife. A physician, he could easily afford a better knife, but his $8 Mora has been taken and used on moose, caribou, elk, deer and hog hunts. So these thing creep up on you. Today, my original Mora is showing some wear around the edges. But whenever I use it, I recall the many, many scout campouts, the kids I loaned it to and good times associated with the outdoors. So it’s not for sale. 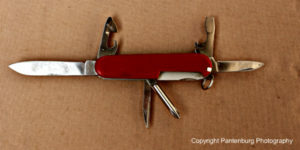 Tinker: My buddy and fellow Boy Scout volunteer Jim Grenfell were discussing/debating what was the best pocket knife. I made a persuasive pitch for the three blade Stockman pattern knives I have been carrying for decades. 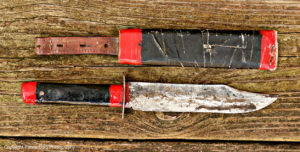 The Swiss Army Tinker is an inexpensive knife that can handle a variety of tasks. Well, I will pass it on, but that won’t be anytime soon. I carry it every day, and it’s on my belt right now as I type. The Tinker is carried in a belt sheath, so the knife doesn’t get pocket lint in the hinges. One of my kids will get it some day. But not for a while. 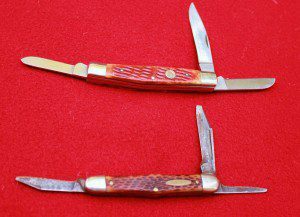 Dad’s Sullivan Stockman: My dad always carried a pocket knife. He wore knives out, in his jobs as an Iowa farmer and carpenter. A working man with a shop and tractor tool box, he was seldom far away for the correct tool for the job. If he needed some a specific tool for a job on the farm, he would generally send me to go get it. 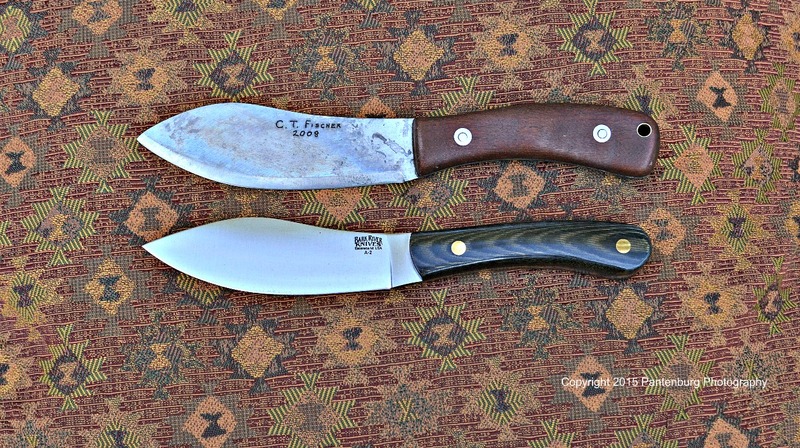 My Puma Birdhunter, (top) resembles my Dad’s Sullivan pocket knife. I tried to get him a bigger knife once but he didn’t want one. The small Stockman did everything he needed a knife for, he said, and was easy to carry everywhere. A bigger knife would just wear out his pocket faster. On the day he died, Dad’s belt had a clip on it for carrying things. His pockets had some loose change, a wallet, keys, handkerchief and his well-used Sullivan Stockman. No way would I part with this knife. Cold Steel SRK: I moved to Idaho in 1990 with the intention of hunting deer and elk in the wilderness backcountry. And I did. Nearly every year my brother Mike and I hunted long and hard in Central Idaho. Our hunts ranged from week long backpack trips along the Lochsa River, to quick overnighters, when we both snuck out of work early on Friday and drove up to the mountains, slept under a tarp and hunted all day Saturday. This SRK was my hunting/survival knife for 20 years in the Idaho backcountry. The SRK was carried for hundreds of miles in the mountains, and was used a lot for hunting. It was loaned out to trusted friends, and the SRK has processed well over 50 deer and several elk. It has been used in below-zero temperatures in the snow and 90 degree days, where field dressing had to take place as soon as possible. The knife worked so well, that two of my elk hunting buddies bought SRKs. Several years ago, I bought a SRK for a friend who refused to take my fair share of the gas money after a hunting trip. Today, I have many better knives. The old SRK rests in honored retirement, ready to go to work any time. My first handmade knife: When I was about 13 or 14, some 50 years ago, I just had to have a sheath hunting knife. I had a single shot Springfield .22 rifle and a bolt action Mossberg 20 gauge, and hunted all the time. My small game hunting knife was a Stockman pocketknife, like my Dad’s, and it was used extensively for skinning squirrels and rabbits and field dressing pheasants and quail. I made this knife when I was about 14. Sheath is white athletic tape daubed with model paint. But everybody knows a real hunter has to have a sheath knife. And some day according to my plan, I would hunt deer and elk in the west. I might even take time off to get a job to pay for those trips. But my aspirations were a lot higher than my budget. So I got a piece of high carbon steel that was formerly a hatchet handle, and set out to make a knife by stock removal. The handle was made of wood, attached with wood screws filed down to be smooth. I didn’t have any leather, so I made a temporary sheath with cardboard and white athletic tape. The sheath and handle were painted with model paint. My first handmade knife resides in my gun safe, and I look at it periodically. One of these days, I intend to make a leather sheath for it. 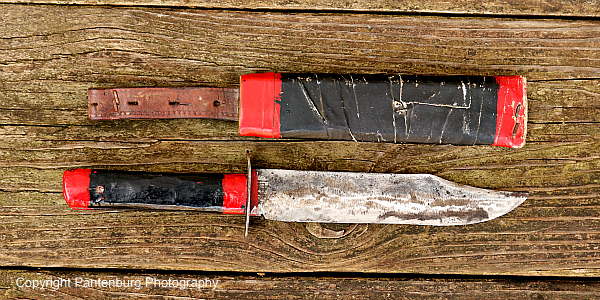 The German knife was what Dad reached for when he needed a utility knife on the farm. It was also his hunting knife. In 1952, the year I was born, he killed a doe in one of Iowa’s first deer seasons with his WWII 16 gauge drilling and gutted it with the Hitler Youth Knife. I am the family archivist of Dad’s WWII memorabilia. A few years back, I sent that knife to my nephew and godson Kevin Spring for safekeeping. It isn’t his yet. But when my term as archivist is over, Kevin will most likely fall heir to the rest of the collection. With the exception of the Hitler Youth Knife, none of my cutlery collection are particularly valuable. But there is something to be said for pleasant memories. When you can hold something in your hand that brings about these good thoughts, it is valuable. It becomes a touchstone. That is what these knives do for me – bring pleasant memories – and why they are not for sale. Handle design video | Most important part of choosing a survival/bushcraft knife? Sentimental value trumps mere cash.